Driving home for Christmas, I was doing my best to get into the holiday spirit by listening to carols on the radio. If you traveled across the Deep South on Festivus, you likely encountered similar conditions. While the carolers on the radio were content to Let It Snow, I was thankful I remembered to replace my windshield wipers that morning, lest I drive off the road and into the lake… which was quickly becoming one with the road. Rather than tales of the glories of Christmases long, long ago, my family back home manned their laptops and smartphones to find out exactly where the storms were and whether I needed to stop, detour, or push the pedal to the floor. On a winter day in the South, you could have an ice storm, a tornado outbreak, or just about anything in between. Christmas in particular has been an active time as of late. Last year, in spite of our generally cold winter, Christmas Day was so warm that the jackets were traded in for t-shirts and shorts. 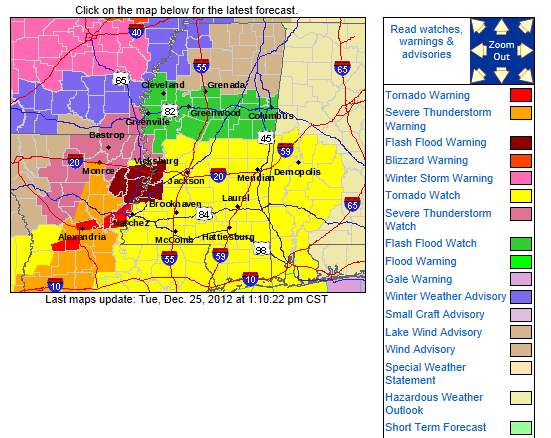 The year before, Santa arrived just ahead of a tornado outbreak/blizzard, producing this colorful array of watches and warnings. Christmas Day 2012 – Tornado Warnings, Blizzard Warnings, and just about everything in between. Yes, I grabbed a screenshot. Weather nerds take no holidays. Gather ‘round children! Open your presents! Ignore the local TV weatherman interrupting the Christmas parades for severe weather coverage. 2012: My sister distributes presents while WAPT meteorologist David Hartman spends Christmas Day doing severe weather break-ins. And it’s not just Christmas. As we turned the page from 2010 to 2011, tornadoes touched down near Jackson, pre-empting most of our fireworks displays. That was the closest I’ve ever been to a tornado – it damaged multiple properties in the neighborhood, and destroyed a home one street over. At midnight, we toasted to still having a roof. Damage from the New Years Eve 2010/2011 tornado near Jackson, MS. In fact, that New Years was the first thing I thought of as I tried to pinpoint a departure for my Christmas journey back to Mississippi. That night, I was watching the radar trying to find a window in which it was safe to navigate my significant other from Memphis to Jackson. She arrived shortly after the rest of us were almost blown away. I made it home safely, and enjoyed a peaceful, relaxing holiday. All was calm, and all was bright. Still, I couldn’t help but think of those people who lived south of my route home. Just before Christmas, many families lost property, and sadly, some lost loved ones. Four people died – two in the small town of Columbia, two more just outside of Laurel. You can find updates and ways to help on the Columbia Mississippi Tornado Recovery Facebook page, and can make a donation through the American Red Cross. Best wishes to you and yours this holiday season, and as we move ahead into 2015. May you have clear skies… until next Christmas, of course.